This sunny beautiful home on a quiet street sits high in the trees and is less than a mile from the beach and Safeway and 5 minutes from Northstar. 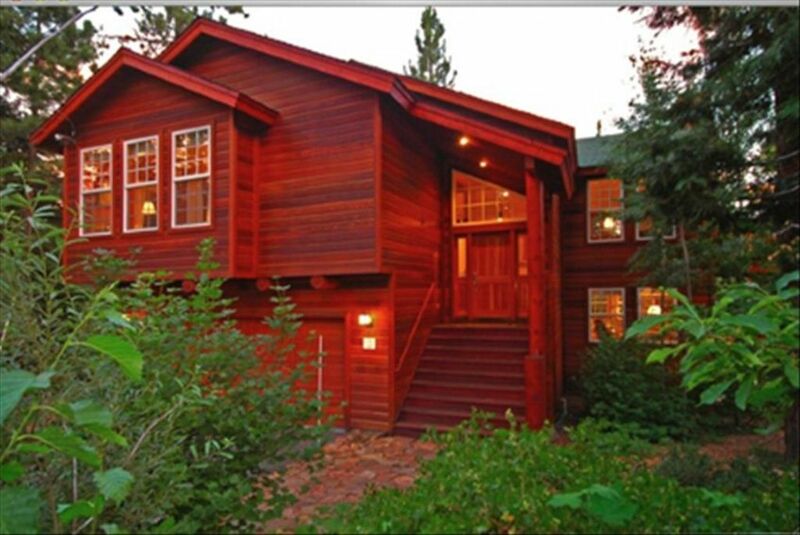 So don't get caught in the traffic to Northstar from Truckee and be a short walk to the lake. The open floorplan is great for entertaining and has a large five burner cooktop island and 4 barstools. The kitchen has all KitchenAid Stainless appliances, granite counters and all the spices and cooking supplies you could need. There's a 65" Sony 4K Smart TV in the living area with DirectTV, Apple TV & 4K BlueRay, plenty of comfortable seating with blankets and a huge river rock wood burning fireplace (dry wood in the garage both pine and oak). The large dining table seats 8-10. There's a Bose CD and bluetooth music devices. There are three queen bedrooms downstairs with feather beds and a king pillow top bedroom upstairs with private bath, double vanity and jetted tub. All rooms have either flannel or cotton bedding depending on season. The master bedroom has a 40'" TV and DVD with Apple TV. Use the queen size AeroBed for more than eight people. Also downstairs is a large room with pool table, 46" TV, elliptical trainer, treadmill and outside access to the 8 person Hotspring Grandee® hot tub. There's a level back yard with a sled hill in back for kids and dogs to play in the snow or on the grass. The garage fits one car with driveway space for 2-3 more. The deck has a stainless gas BBQ, double wide lounger and a bar table for 4. A trail at the end of the cul-de-sac winds through the woods to the North Tahoe State park (almost 2 miles) that has frisbee golf, sports fields and tennis courts. We also have an assortment of sleds. It's a quick 10 minute drive to Northstar with less traffic than if coming in from the Truckee side. Diamond Peak is about 20 minutes away and it's usually less crowded than other resorts. Gambling and concerts at Nevada state line casino's 5 miles away: Tahoe Biltmore, Crystal Bay and Cal Neva. Incline Hyatt is 15 minutes away.